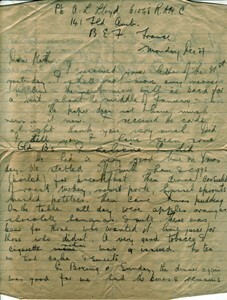 Letter from Lewis Lloyd to his Mother dated Monday December 27th. He says he will not be moving any closer to the front and the next move will be back for a rest. He also talks about his Christmas and boxing day food and mentions a man who fell down a well. 1 page. 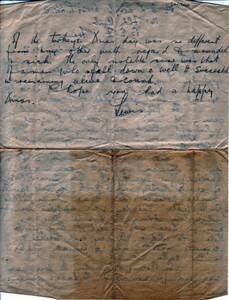 There is also the original envelope stamped ‘FIELD POST OFFICE 3 A 29 DE 15’ and ‘PASSED BY CENSOR No. 2000’.